Middlefield’s Parks and Recreation Department will not seek a permit to apply an aquatic herbicide to reduce weeds at the town’s beach swim area. Officials said curly-leaf pondweed is already too far grown in the lake for the treatment. In May Eagle Bend took the first step toward eradicating curleyleaf pondweed from its channel and harbor by treating them with herbicide. The next step is to come up with a plan for treatment of Flathead Lake, Flathead River and Fennon Slough. Erik Hanson of the Aquatic Invasive Species working group is crossing his fingers that treatment can start before the end of the summer. The Westford Board of Health is reporting that portions of Nabnasset Lake will be chemically treated with an aquatic herbicide on Thursday, June 7 with the goal of eradicating non-native plant species such as Curly leaf pondweed and Milfoil. 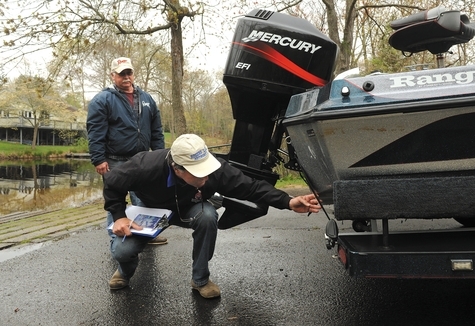 CRYSTAL LAKE — The Crystal Lake Park District plans to treat Crystal Lake with a herbicide to help control invasive aquatic plants. The Tri-Lake Administrative Commission will continue to work with Skip’s Aquatic Solutions in treating invasive aquatic vegetation in Smith Mountain Lake. The board agreed to renew the company’s contract during a meeting held May 1. Skip’s Aquatic Solutions uses systemic and contact herbicide to treat non-native aquatic vegetation such as curlyleaf pondweed, Brazilian elodea and hydrilla. Fanwort, Eurasian water milfoil, curly pondweed and hydrilla are among the enemies, and humans, their chief enablers. That’s why Mike Sicord spent Saturday morning, the opening day of fishing season, manning the state boat launch at Rogers Lake, working alongside Santy Patana, the boat launch attendant for the Rogers Lake Authority, checking boats for plant debris and talking to boaters about the problems caused by invasive plants.